Do you want to clean your bathroom to perfection because friends will be staying in your home for a couple of days? Is it time for a spring clean? If your bathroom needs a good scrub, then it will receive a good scrub. All you have to do is hire our company and you will be fine. 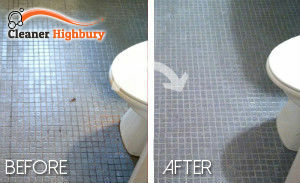 Our bathroom cleaning service in Highbury, N5 is specially designed for your bathroom. We use the right cleaning approach and we utilise bathroom cleaning products. We promise that it will be worth your money. Be sure to call our assistants and set up an appointment. 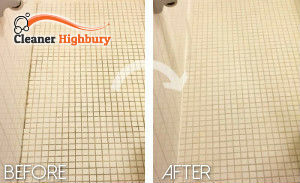 We will provide an effective bathroom cleaning service in Highbury that will include every surface in your bathroom. No matter how much time we will have to spend, we will do our best to achieve the desired results. You will be delighted with the results. With time limescale might show up on your taps, shower head, shower cabin, bath tub and even on the bathroom floor. It is a white film that is quite difficult to clean, especially after it hardens. Trying to scrub it down might slow you down and you might not be able to clean your bathroom in a day. We suggest you stop worrying about it. Instead come to our company and get our bathroom cleaning service in Highbury, N5. We will send a cleaner or two to handle all the cleaning jobs. Instead of spending your spare time cleaning grime, make some time for your friends and family. You only need to call us and schedule your cleaning session with our company. It will take about 5-10 minutes to get things ready. We won’t let you down. We suggest you ring us up with any questions you might have and let us explain everything to you. Setting up an appointment is quite easy and fast. Let our operators know what you need and they will prepare things for you.